This project won an Interpretation Australia Award Bronze Award for Excellence in 2010 for projects under $15,000. Dr Rebecca Overeem (Education and Interpretation Manager): Rebecca manages logistics of the Heritage Farm Ranger Talks. She ensures that all Rangers are well trained and fully briefed on the school group that is visiting Churchill Island. Rebecca make sure that any special needs of a group are met so that each student is provided with an amazing hands on history adventure. Jade Cranton (Education and Marketing Executive): Jade is kept busy booking the Heritage Farm Ranger Talks. She provides a wealth of knowledge to schools to ensure their needs are met on the day of their visit. Jade also visits schools and undertakes marketing displays to promote the Heritage Farm Ranger Talks. Graeme Burgan (Education Ranger): Has an in depth knowledge of the traditional owners of Churchill Island, the Bunurong. He has trained with the local indigenous peoples and has been given permission to retell the amazing stories. Carissa Logan (Education Ranger): Carissa has been part of Phillip Island Nature Park for ten years and has a wealth of knowledge of Churchill Island. Carissa is also our ‘Chef’ having mastered our 1860s oven she engages students with her scone making and butter churning activities. She is also known for her ability to spin a yarn of wool. Jacqui Higgins (Education Ranger): Is passionate about the family history linked with Churchill Island. Charatcters come to life as Jacqui tells the amazing story of the women of Churchill Island, including Winifred Pickersgill and her gambling husband! Cara Richardson (Education Ranger): Is our ‘horse whisperer’ caring and respectful with the animals of Churchill Island. Cara was part of the Nature Park when rabbits were about to destroy the 200 year old Moonah forests and ensures that all students meet our hard working team of ferrets. With Cara’s guidance students happily milk the cows and feed the sheep grain. Sue Graham (Education Ranger): Is the newest addition to our team and loves the ‘old time games’. Sue ensures that students use precision for the egg and spoon race and jump about for the sack race. Project description including purpose (and why it was needed), location, mission, aims and objectives. Phillip Island, located 120km from Melbourne, has been a popular holiday destination for over one hundred years. Churchill Island is located just offshore from Phillip Island and is easily accessed by bridge. This little island gem was under private ownership for 120 years but was classified as crown land in 1976. In 1996 Phillip Island Nature Park began to manage the Island and every effort has been made to ensure that the natural significance of the Island is respected while the important farming culture is maintained. Today, the 500 year old Moonah forest is protected, the historic garden is well maintained and the rustic charm of the heritage farm is conserved. The purpose of the Heritage Farm Ranger Talk is to educate Primary School students within the Victorian Essential Learning Standards (VELS) levels 1-4. We aim to enhance student knowledge about the rich history of the area including the Bunurong and early European settlers through engaging activities and tales of farming life in the 1800s. When Phillip Island Nature Park was formed in 1996 it was envisaged that the Nature Park would be ‘a world leader in environmental, economic and socially sustainable nature-based and eco-tourism experiences’. As a result the Phillip Island Nature Park mission is to ‘conserve and enhance the Nature Park’s environment for current and future generations while achieving a balanced environmental, economic and social outcome’. The Education team mission is therefore derived from the Parks mission statement aiming ‘to develop a greater understanding of the natural environment through exploration, investigation and hands-on activities’. Always consider the environmental impact of talks, resources and purchases. The audience for the Heritage Farm Ranger Talks is Primary School students aged 6-12. The majority of students are from Victorian Government schools who are participating in Grade 4-6 camps. The students vary in cultures and are from a wide range of socio-economic backgrounds, with some students living on farms while others have never seen a cow before. The expectations of the teachers and students that undertake the Heritage Farm Ranger Talks vary greatly. Some classes are studying ‘early explorers’ in the classroom and utilise the Heritage Farm Ranger Talk to reinforce concepts covered while other teachers utilise the Ranger Talk as a way to change the students perceptions of history, making it fun, leisurely and enjoyable. Issues that we face while running the Heritage Farm Ranger Talks are weather and working with animals- both are unpredictable! We overcome these issues by ensuring there are covered areas in which to undertake Ranger Talks and interpreting why the animal is behaving a certain way. Flexibility is a core ingredient to this program. The Heritage Farm Ranger Talk utilises personal interpretation amongst the sculptures, buildings, monuments, and the ancient Moonah trees of the island. Students are able to interact with Rangers face to face and undertake activities such as butter churning, milking the cow and old time games. Our group ratio of one ranger with 25 students ensures a personal experience for the students. Rangers have a wealth of knowledge about Churchill Island and excellent communication skills, with the ability to cater for groups with special needs. The Heritage Farm Ranger Talk has been designed especially for Churchill Island. 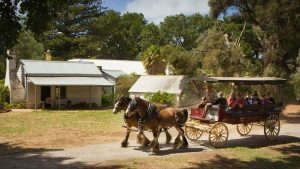 Rangers incorporate the 500 year old Moonah tree forest, the historic homestead, farm yards and garden from the 1860s. Utilisation of these aspects of Churchill Island is suited to Primary School aged students as they are able to see, touch and experience everything Churchill Island has to offer while having fun! Initially Rangers experienced some problems with temperature regulation in 150 year old ‘Rogers Cottage’ oven, however, these problem were overcome through team work and persistence. The northern portion of Churchill Island has been fenced off from rabbits in order to protect the 500 year old Moonah forest. As a result, Rangers must insure that students are respectful of this area and always stay on the walking tracks provided. The homesteads, machinery and animals are all part of Churchill Island environment and must be shown respect. Students are asked to walk not run through the historic precinct and take all litter with them. The Churchill Island Marine National Park is situated on the west side of Churchill Island and therefore actions that take place on Churchill Island such as littering and soil erosion from an increase in foot traffic impact upon the marine environment. The Heritage Farm Ranger Talk presents a story of the past, present and future through a combination of stories and experiences. Students learn about geology through being able to look at the different rock types on the shores of Churchill Island. They experience the dreamtime by using their imaginations to make the story of the Moonah tree come alive. Students are immersed in the European heritage of the Island through listening to tales of the homesteads, making scones in the 1860s oven and undertaking role plays of the chores children in the 1950s -70s would have undertaken. Rangers who undertake the Heritage Farm activities are passionate about the environment, ensuring an effective and memorable experience for the students. The Heritage Farm Ranger Talk provides for a large array of visitors. Special interest groups are catered for through modification of talk content and activities. Language groups are catered for through interpreters or demonstrations which allow the students to interact and engage with the topics. The Heritage Farm Ranger Talk may be modified for special needs groups to include more hands on activities, props and demonstrations in which students can readily interact with less talking and listening time to ensure the students are engaged. As the Heritage Farm Ranger Talk is a guided experience Rangers can cater for the pace of their group, changing methods depending on engagement levels. Churchill Island is wheelchair friendly with walking tracks, easy access to the homesteads and Visitors Centre and designated toilet throughout the Churchill Island precinct. The Heritage Farm Ranger Talk requires that Rangers and volunteers are trained in several areas. Rangers and volunteers must be trained in working with children and animals as well as have a strong grasp on the knowledge of the island. We are very fortunate to have several dedicated Rangers who have a wealth of knowledge about Churchill Island. One Ranger has been working on Churchill Island since 1996 and is an amazing source of information and folk tales. Moreover, training is required to churn butter, make scones in a 1860s over, spin wool and milk the cow. Tour operators undertake ‘famils’ with the school groups in order to fully understand what is provided in the Heritage Farm Ranger Talk. The Heritage Farm Ranger Talk is part of a multi-stage project. The Phillip Island Nature Park Education team is constantly reviewing the Ranger Talks we provide ensuring that they cater for the needs of schools and the curriculum. As a result the Heritage Farm Ranger Talk will evolve depending upon the curriculum and the requirements of the groups. The Heritage Farm Ranger Talk is undertaken in conjunction with the Phillip Island Nature Park Education Strategy. The Ranger Talk engages a wide audience and achieves the teams aim as it allows students to develop a greater understanding of the natural environment through exploration, investigation and hands-on activities’. As a result, the Education and Marketing teams work closely together to ensure that the Heritage Farm Ranger Talk is marketed to all schools through brochures, our website, displays at conferences and teacher orientated events.